Description: Durable, double-wall stainless steel vacuum construction with copper insulation, which allows your beverage to stay cold for 48 hours and hot for at least 12 hours. Features: The construction also prevents condensation on the outside of the bottle. On-trend, durable powder coating. 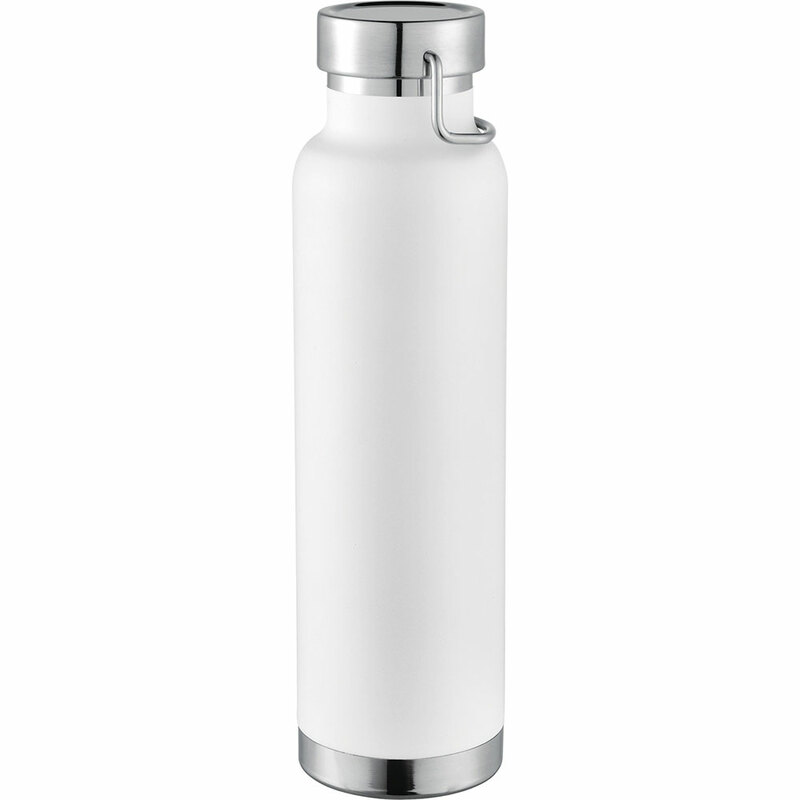 Stainless steel screw-on, spill resistant lid with durable stainless steel hand loop. Wide opening for comfortable filling and pouring. Perfect for ice cubes. Fits most standard car cup holders. Capacity 650ml. Packaging: Bubblebag Colour: White Material: 18/8 GradeStainlessSteel Product Size: 269mm(h) x 73mm ? (without handle) Freight details : 24 per carton, 9kgs, 47 x 33.5 x 30cms; Decoration Type(s): Colour Print / Full Colour Print / Laser Engrave Decoration Area: Print: Varies depending on print method; Laser: 30mm(w) x 45mm(h) or 20mm(w) x 80mm(h) on Body, 35mm(dia) on Lid. Price includes : 1 Colour 1 Position Print. Setup is included.